In the Atlantic Ocean: Hurricane Leslie is located about 1005 mi…1615 km sw of the Azores with maximum sustained winds…80 mph…130 km/h. Present movement…ene or 65 degrees at 10 mph…17 km/h. Tropical Storm Michael is located about 40 mi…65 km wnw of Columbia South Carolina with maximum sustained winds…50 mph…85 km/h. Present movement…ne or 45 degrees at 21 mph…33 km/h. Tropical Storm Nadine is located about 595 mi…960 km w of the southernmost Cabo Verde islands with maximum sustained winds…65 mph…100 km/h. Present movement…nw or 325 degrees at 8 mph…13 km/h. In the Eastern Pacific Ocean: Tropical Storm Sergio is located about 600 mi…970 km w of the southern tip of Baja California with maximum sustained winds…65 mph…100 km/h. Present movement…ne or 50 degrees at 17 mph…28 km/h. In the Indian Ocean: Tropical cyclone 05a (Luban), located approximately 275 nm east- southeast of Salalah, Oman, is tracking westward at 02 knots. Tropical Cyclone Titli is located approximately 312 nm southwest of Calcutta, India, is tracking west-northwestward at 08 knots. Nigeria – The death toll from floods across much of central and southern Nigeria has reached 199, the national disaster agency said on Wednesday, almost doubling the number of people killed from three weeks earlier. The almost annual floods, exacerbated by poor infrastructure and lack of planning to protect against inundation, are the worst since 2012, when at least 363 people died. Majorca – At least 10 people were killed and a child remains missing after heavy rain and flash floods hit the Spanish island of Majorca on Tuesday night, regional authorities said Wednesday. Seven roads in the area were cut off, regional authorities said. Some schools were closed Wednesday because of the floods. Five of the deaths occurred in the Sant Llorenç area, about 35 miles east of the Balearic island’s capital, Palma. In the Atlantic Ocean: Tropical Storm Leslie is located about 720 mi…1155 km ene of Bermuda with maximum sustained winds…50 mph…85 km/h. Present movement…wsw or 240 degrees at 5 mph…7 km/h. In the Eastern Pacific Ocean: Hurricane Rosa is located about 385 mi…625 km sw of Punta Eugenia Mexico and about 585 mi…940 km ssw of San Felipe Mexico with maximum sustained winds…85 mph…140 km/h. Present movement…n or 5 degrees at 12 mph…19 km/h. Tropical Storm Sergio is located about 485 mi…780 km s of Manzanillo Mexico with maximum sustained winds…50 mph…85 km/h. Present movement…w or 270 degrees at 12 mph…19 km/h. In the Western Pacific Ocean: Typhoon 28w (Trami), located approximately 131 nm south-southeast of Iwakuni, Japan, is tracking northeastward at 25 knots. Typhoon 30w (Kong-Rey), located approximately 288 nm north-northwest of Ulithi, is tracking northwestward at 09 knots. In the Central Pacific Ocean: Tropical Storm Walaka is located about 610 mi…980 km se of Johnston island about 725 mi…1165 km ssw of Honolulu Hawaii with maximum sustained winds…40 mph…65 km/h. Present movement…w or 270 degrees at 16 mph…26 km/h. California, USA – The moisture from Hurricane Rosa could pose a risk of flash flooding to Baja California, eastern California, Las Vegas and Arizona as it approaches the coast late Sunday. The remnants of Rosa could bring as much as a year’s worth of rain to desert areas such as California’s Imperial Valley and Arizona’s Yuma County — both significant producers of vegetables for the nation. Greece – Swirling winds and torrential rain brought flash floods to parts of Greece on Saturday as a rare type of storm known as a “Medicane” which can develop in certain conditions over the Mediterranean Sea hit the country. Ships were held at Greece’s main ports and traffic was disrupted in several areas as roads flooded due to the heavy rain. Gusting winds blew garbage bins off the streets of Athens and led to power cuts and falling trees across the country. Nigeria – Floods in Edo State have killed at least 6 people with no fewer than 42 communities, 8,000 houses and 35,150 persons affected by the floods. In the Atlantic Ocean: Tropical Storm Kirk is located about 75 mi…120 km wsw of St. Lucia and about 125 mi…200 km ssw of Martinique with maximum sustained winds…50 mph…85 km/h. Present movement…wsw or 240 degrees at 12 mph…19 km/h. In the Eastern Pacific Ocean: Hurricane Rosa is located about 605 mi…975 km sw of the southern tip of Baja California with maximum sustained winds…145 mph…230 km/h. Present movement…w or 265 degrees at 9 mph…15 km/h. In the Western Pacific Ocean: Typhoon 28w (Trami), located approximately 234 nm south of Kadena AFB, Japan, is tracking northwestward at 06 knot. Tropical depression (td) 30w (Thirty), located approximately 531 southeast of Anderson AFB, Japan, is tracking westward at 18 knots. In the Southern Hemisphere: Tropical cyclone (tc) 02p (Liua), located approximately 514 nm northwest of Port Vila, Vanuatu, is tracking westward at 06 knots. Nigeria – Nearly 200 people have died in flooding caused by heavy seasonal rains across 12 states in Nigeria. The National Emergency Management Agency (NEMA) said on Thursday that 199 people were killed after the main Niger and Benue rivers burst their banks.A national disaster was declared in several central and southern states. More than 286 000 people have been left homeless. Connecticut, USA – South Connecticut was hit by flash floods with some areas seeing more than six inches of rain. Some roads were completely impassable following the downpour and fire departments warned motorists to avoid driving. In the Atlantic Ocean: Post Tropical Cyclone Florence is located about 105 mi…170 km wnw of New York City and about 100 mi…165 km nnw of Philadelphia Pennsylvania with maximum sustained winds…25 mph…35 km/h. Present movement…e or 100 degrees at 13 mph…20 km/h. Tropical Depression Joyce is located about 355 mi…570 km s of the Azores with maximum sustained winds…35 mph…55 km/h. Present movement…sse or 165 degrees at 6 mph…9 km/h. East Coast, USA – Florence is expected to produce heavy to excessive rainfall through Tuesday. Portions of the northern Mid-Atlantic states and southern New England are expected to receive an additional 2 to 4 inches of rain…with isolated maximum amounts of 6 inches possible. The storm is blamed for at least 32 deaths, say officials quoted by the Associated Press. Twenty-four of those were in North Carolina. Life-threatening floods are expected to continue all this week, according to the National Weather Service. In Virginia, one person was killed as a result of a tornado associated with Florence. Nigeria – Rainy season flooding across Nigeria has killed more than 100 people, as water poured over the banks of the West African country’s two major rivers, and into numerous cities and towns. 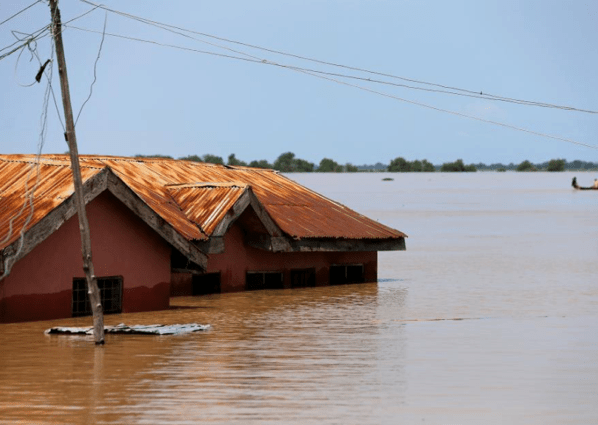 Over the weekend, the Nigeria Hydrological Services Agency reported that the Benue and Niger Rivers were close to reaching levels that in 2012 led to floods that killed more than 350 people and wiped out scores of homes, farms and other property. In the Atlantic Ocean: Sub-Tropical Cyclone Beryl is located about 455 mi…735 km nne of Bermuda and about 420 mi…675 km s of Halifax Nova Scotia with maximum sustained winds…35 mph…55 km/h. Present movement…ene or 65 degrees at 13 mph…20 km/h. In the Eastern Pacific Ocean: Invest 99E is an area of disturbed weather in the eastern Pacific that has the potential for further tropical development. In the Western Pacific Ocean: Tropical depression 11w (Eleven), located approximately 305 nm northeast of Manila, Philippines, is tracking westward at 12 knots. Nigeria – Flooding and heavy rains are affecting many parts of Nigeria. Dozens of people have been killed and crops have been lost, raising fears of a food shortage. New Zealand – Wild weather in New Zealand over the weekend has wreaked havoc closing numerous roads and highways around the country. In the Coromandel, SH25 remained closed. A number of Auckland roads were closed due to the severe weather. In the North Atlantic Ocean: Tropical Depression Harvey is located about 30 mi…50 km NNE of Alexandria Louisiana and about 100 mi…160 km SE of Shreveport Louisiana with maximum sustained winds…35 mph…55 km/h. Present movement…NNE or 30 degrees at 9 mph…15 km/h. Hurricane Irma is located about 840 mi…1350 km WNW of the Cabo Verde islands and about 1665 mi…2680 km E of the Leeward Islands with maximum sustained winds…115 mph…185 km/h. Present movement…WNW or 300 degrees at 12 mph…19 km/h. In the Eastern Pacific: Tropical Storm Lidia is located about 50 mi…85 km WSW of La Paz Mexico and about 105 mi…170 km SE of Cabo San Lazaro Mexico with maximum sustained winds…65 mph…100 km/h. Present movement…NW or 325 degrees at 8 mph…13 km/h. In the Western Pacific: Typhoon 17w (Sanvu), located approximately 46 nm east-northeast of Chichi Jima, is tracking east-northeastward at 07 knots. Tropical Depression 18w (Mawar), located approximately 253 nm east-southeast of Hong Kong, is tracking north-northwestward at 07 knots. Nigeria – More than 100,000 people have had to flee their homes after heavy rains and flooding in Nigeria’s southeastern Benue state, President Muhammadu Buhari said late Thursday. The region had been battered by heavy rains over the past two weeks with the level of the Benue river rising. Cars and thousands of homes were completely submerged. Long lines of men and women were seen carrying mattresses, bags and other belongings as they fled on foot. Pakistan – Flash monsoon flooding in Karachi, Pakistan’s largest city, has claimed the lives of at least 16 people, most of them children, officials confirmed Friday. At least 11 deaths have been attributed to electrocution, as rising waters become electrified in low-lying urban areas. Karachi is the latest major South Asian city to be hit by heavy monsoon rains amid a widening flood-related crisis engulfing much of the region. At least 62 people are confirmed dead by a yet-to-be-diagnosed disease, a health official in Nigeria’s north central Kogi state has said. Preliminary laboratory tests of samples from the affected areas tested negative for lassa fever — a disease whose symptoms include high fever, swelling and bleeding. In the Western Pacific: Typhoon 07w (Noru), located approximately 151 nm southeast of Sasebo, Japan, is tracking northeastward at 07 knots. Las Vegas, USA – Heavy rain from afternoon thunderstorms in Las Vegas triggered flash flooding. Seven people were rescued; one person was killed. Nigeria – Floods have destroyed many properties and rendered thousands homeless in Benue and Katsina States, Nigeria. In the Western Pacific: Typhoon 07w (Noru), located approximately 220 nm northeast of Kadena AB, is tracking west-northwestward at 05 knots. Tropical Storm 13w (Nalgae), located approximately 536 nm northeast of Minami Tori Shima, is tracking north-northwestward at 06 knots. Vietnam – Flash floods triggered by heavy rains have killed seven people and left 27 others missing in northern Vietnam. Disaster official Luong Tuan Anh said Thursday two people died and 13 are missing in the worst hit province of Yen Bai. Some 900 government forces have been mobilized to search for the missing. The other casualties were reported in the neighboring provinces of Son La and Lai Chau. Thailand – Floods have killed at least 23 people in Thailand’s northeastern farming region, the interior ministry said on Thursday. Ten of Thailand’s 77 provinces are disaster zones, the Interior Ministry said, adding that most of the 700,000 hectares (1.7 million acres) affected were rice-growing farmland. Nigeria – Ten persons have reportedly been killed, while 7342 others displaced in Plateau State by floods, between April and July 2017 according to local reports. 832 villages were submerged by floods during this period. In the Eastern Pacific: Hurricane Eugene is about 540 mi…870 km SW of the southern tip of Baja California with maximum sustained winds…100 mph…155 km/h. Present movement…NW or 320 degrees at 12 mph…19 km/h. Paris, France – Paris subway authorities closed metro stations due to flooding after thunderstorms and heavy rain pounded the French capital, officials said Monday. A violent two-hour storm struck the city late Sunday, forcing the closure of about 15 stations due to flooding. The downpours resumed early Monday, and the national weather service Meteo France placed 12 departments, including those in the greater Paris region, on a 24-hour “orange alert” for heavy rains and electrical storms. India – Floods caused by heavy rainfall continued to wreak havoc across Assam on Monday claiming seven more lives and taking the total deaths to 34. According to a state disaster management authority report, over 1.2 million people in 20 of the total 28 districts remained affected in both Brahmaputra and Barak valleys. Over 2,000 villages remained inundated on Monday and over 1 million hectares of crop area affected. More than 18,000 people displaced by floods are taking shelter in 148 relief camps. Heavy rainfall has led to erosion of embankments at several places, blocked highways, caused landslides and damaged roads and bridges. Nigeria – For much of the weekend, Lagos, Africa’s largest city, has been hit badly by heavy floods. But with the city’s drainage system mostly poorly planned and, in some places, non-existent, flooding has become a costly annual experience. The floods have been mainly seen on Lagos Island, the major business district, with paved roads and streets flooded. Some of the worst hit areas are also the country’s most expensive residential and commercial real estate in neighborhoods like Victoria Island and Lekki. Tropical Storm Ivette is located about 1180 mi…1905 km E of Hilo Hawaii with maximum sustained winds…45 mph…75 km/h. Present movement…WNW or 290 degrees at 12 mph…19 km/h. Tropical storm 07w (Omais), located approximately 474 nm southeast of Yokosuka, Japan, is tracking north-northwestward at 12 knots. Sudan – Flooding at an Internally Displaced Persons (IDP) camp in Darfur State in Sudan has claimed the lives of four people. About 183 houses in the camp have destroyed. The Sudanese National Council for Civil Defence had forecast heavy rainfall during the coming days throughout Sudan. Vietnam – Flooding in northern Lào Cai Province of Vietnam due to Typhoon Nida has claimed the lives of four people and left seven others missing. Three people died in the mountainous Bát Xát District and one other in Sa Pa District. India – A landslide near Ardhkuwari Temple, in the Katra District of Jammu and Kashmir has killed four people and injured seven others. Norway – Oslo police are urging motorists to stay home after heavy rains and flash floods snarled road and rail traffic in the Norwegian capital. Rains over southeastern Norway on Saturday forced authorities to close a key tunnel and highway sections to and from Oslo where cars were stuck in the water. There were also reports of flooded and waterlogged homes and businesses. Nigeria – Following intense rainfall and rises in water level, the National Emergency Management Agency has advised communities along the river Niger to evacuate immediately to safer ground over the likelihood of floods that may occur at any moment from now. More than 1200 people living in a camp for internally displaced people in northeastern Nigeria have died from starvation and sickness during the last year in what is becoming “a catastrophic humanitarian emergency,” according to the medical humanitarian organisation Medecins sans Frontieres. The camp, located in a hospital compound in the remote town of Bama in Nigeria’s Borno state, hosts about 24,000 people, including 15,000 children, and they are in a “dire health situation,” the aid agency said last week. Violence in northern Nigeria fuelled by the Islamist extremist group Boko Haram has forced more than 2.5 million people to flee their homes, according to United Nations statistics. A medical team from Doctors Without Borders was able to get into Bama for the first time for a few hours on Tuesday to do an assessment, the aid group said. The team discovered 16 severely malnourished children at immediate risk of death and about 150 more youngsters suffering from “severe acute malnutrition,” the deadliest form of the condition, according to the group. The sickest children were being treated at medical facilities in Maiduguri, the capital of Borno state. The growing Lassa fever outbreak in Nigeria has killed 101 people, as West Africa battles to contain a flare up of the virus, according to data from the nation’s health authorities released Saturday. Nigeria Centre for Disease Control (NCDC) statistics show that reported cases of the haemorrhagic disease — both confirmed and suspected — stood at 175 with a total of 101 deaths since August. While health authorities assure Africa’s most populous country of more than 170 million they have the virus under control, there are fears the actual scale of the outbreak is under-reported. The outbreak of Lassa fever was only announced in January — months after the first case of the disease happened in August — with subsequent deaths reported in 10 states, including Abuja. In neighbouring Benin at least nine people have died in a Lassa outbreak, with a total of 20 suspected cases, health authorities said Tuesday. The National IHR Focal Point of Nigeria has notified WHO of different outbreaks of Lassa fever occurring in the country. Between August 2015 and 23 January 2016, 159 suspected cases of Lassa fever, including 82 deaths, were reported across 19 states. Investigations are ongoing and a retrospective review of cases is currently being performed; therefore, these figures are subject to change. On 23 January 2016, the National IHR Focal Point for the Dominican Republic notified PAHO/WHO of 10 laboratory-confirmed cases of Zika virus infection. The small outbreak of typhoid fever that was reported in Gauging has now spread to the Western Cape. Three cases of typhoid fever have been reported in the Western Cape, the provincial health department said on Thursday. Less than a week after Bareilly reported an outbreak of foot-and-mouth disease virus (FMDV) which killed more than a dozen head of cattle, 26 cattle in the Pinahat area of Agra are suspected to have died of the disease. Three persons have been confirmed dead with over 200 others currently under observation following the outbreak of Lassa fever in Rivers State, the Commissioner for Health in the state, Dr. Theophilus Odagme has said.